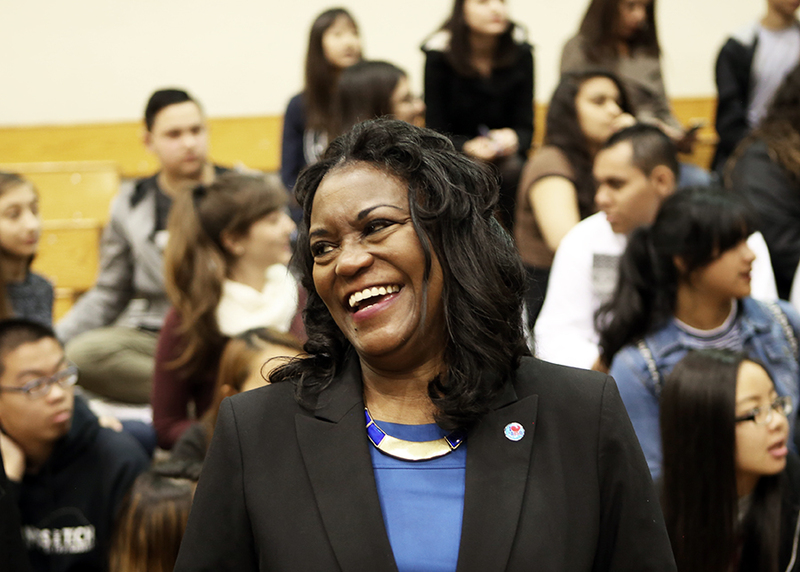 LA Unified Superintendent Michelle King at an April 2016 rally at San Gabriel High to introduce a bill in the Legislature to help more students enroll in college prep courses. At a time when California schools are introducing a range of landmark reforms, there is a continuing churn in the leadership of many of the state’s largest districts. An EdSource survey of the state’s 30 largest districts indicates that in 17 out of 30 districts, the superintendents have been in office for three years or less. In nine of those districts, superintendents have served for less than a full year. Three are interim appointments during ongoing searches for permanent appointments. Only seven of the surveyed superintendents have been leading their districts for five years or more. Only two – Michael Hanson in Fresno and Chris Steinhauser in Long Beach – have been in their posts for 10 or more years. The survey results in these districts are not intended to be representative of California’s nearly 1000 school districts, but they highlight the extent of leadership turnover in the state’s largest, mostly urban districts. The combined enrollments of the 30 districts total about one-third of the state’s 6.2 million public school students. Education experts worry that continuing turnover in school leadership could hamper implementation of a basket of reforms, including the state’s new accountability system and the Common Core standards in math and English, along with their potential to improve student academic outcomes. For interviews with four California superintendents appointed in 2016, go here. Irvine Unified Superintendent Terry Walker, appointed to his post in 2011, said experience translates into a far more effective school leader. But many experts agree that it takes far longer for reforms to take root than the average length of time that many superintendents stay in their positions. Just how long is up for debate. Marshall Smith, the former dean of the Stanford Graduate School of Education and undersecretary of education, thinks that an even longer timespan is necessary. “Unless you are there for eight to nine years, you can’t expect to make big changes and to make sure the reforms stick,” Smith said. Kelvin Lee, the former long-time superintendent of Dry Creek Elementary District just outside Sacramento, said the stressors for superintendents in small districts are different, although equally if not more intense. That’s at least in part because superintendents in small districts typically have much less administrative support. Turnover is not always disruptive, and can even be positive. In some cases, an incoming superintendent may already have been in the district for many years in a subordinate position, ensuring continuity with the policies of the outgoing superintendent. In other cases, new blood can invigorate a district, and lead to positive change. But the change can frequently be a difficult one. In Los Angeles Unified, the district had a painful separation from John Deasy in 2014, who was succeeded by former superintendent Ramon Cortines, whom the school board brought back on an interim basis. As is the case in several districts with new superintendents this year, school boards turned to an insider to help ensure a smooth transition. To replace Cortines, in January of this year the Los Angeles Unified board chose Michelle King, the ultimate insider who had gone through the district as a student, and had spent her entire professional career in the district as a teacher, principal and administrator. San Francisco Unified also had a painful separation from Richard Carranza when he abruptly left the district in September after four years there to become superintendent in Houston. Carranza had also been a finalist for the L.A. Unified position. His departure is viewed as a significant loss to the district, and unlike in Deasy’s case, the school board was sorry to see him go. It has appointed longtime administrator Myong Leigh as interim superintendent. In Santa Ana, the district is being run by its third superintendent in four years. But unlike the last two superintendents, who were selected from outside the district, the board chose Stefanie Phillips, who had been the deputy superintendent of business and operations for the previous three years. Similarly, San Jose Unified selected veteran administrator Nancy Albarrán, who most recently had been assistant superintendent of instruction, to succeed Vince Matthews, who left to become state administrator for Inglewood Unified. Sacramento County Superintendent of Schools David Gordon said one factor behind high turnover rates are school board members who select the superintendents and are up for re-election every four years. That means they are often looking for big changes within an unreasonably short time period. One positive sign, Gordon said, is that this year there has been more stability in leadership in the 13 school districts in his county than he has seen in years. None of the districts has a new superintendent this year. Matt Duffy, the new 43-year-old superintendent in West Contra Costa Unified, says he belongs to a younger generation of school leaders. He replaced Bruce Harter, who retired after 10 years as superintendent. Duffy said that he believes that the key to making reforms work is for individual schools to drive the reforms, rather than having it all come from the superintendent’s office. At San Ramon Valley Unified, a district east of San Francisco with a largely affluent student body, Superintendent Rick Schmitt says the transition has been a smooth one since he came to the district in July. That’s in part because of the school board, which he said is looking for continuity rather than radical change. “The board didn’t hire me to blow it up and start over,” he said. Many ascribe leadership turnover to the near impossibility of the job itself. “The magnitude of it can really wear you down,” said West Contra Costa’s Duffy. The key to longevity, he said, is having a positive relationship with a district school board. “You can go far longer when the board and the superintendent are aligned,” he said.